The Brecksville-Broadview Heights Robotics team hosted its 4th annual VEX Qualifier at the Middle School this past Saturday, November 10, 2018, with nearly 80 schools gathered in competition and making it the single largest tournament in the country. 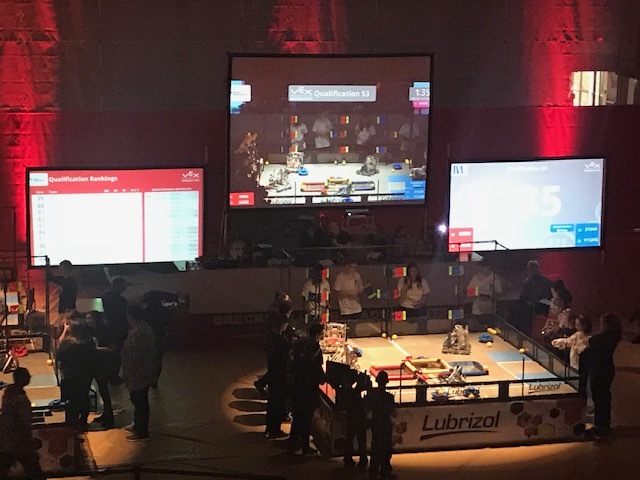 Six of the seven total BBHCSD Robotics’ teams qualified for the actual tournament, which was designed to showcase the top Robotics teams and students in the State of Ohio and from neighboring Pennsylvania. Teams 2011C and 2011F both paired up together to make it to the finals before falling short in the championship match. Team 2011B won the judges award and Team 2011C was named the top overall team by winning the Excellence award. Approximately 500 students in total participated in this competition, and the BBHCSD congratulates the Robotics Team for their fine representation of the District and for their success this weekend!